The Expected Closing Date (ECD) is unique for each deal and represents when the deal is expected to be closed. 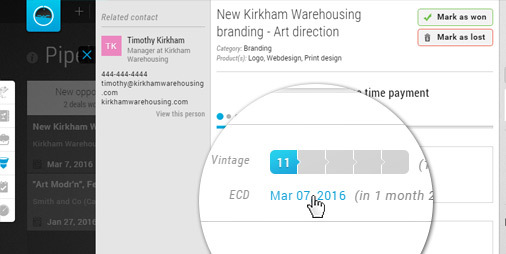 The ECD is also used for calculating your sales forecast, and it also helps you filter your deals better. The ECD for a deal can be changed either from the Pipeline or from the deal view. The ECD has now been updated. Overdue deals still appear in the Pipeline, but their values are being excluded from the Pipeline value. 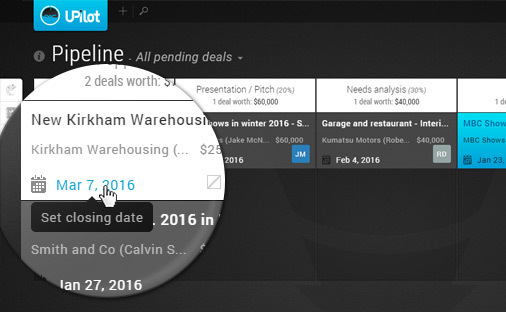 Keep your deals up-to-date and don’t let overdue deals (red calendar icon) hang around in your Pipeline. Update them by setting a new ECD in the future.